Traffic congestion in Pietermaritzburg could soon be eased considerably if Msunduzi Municipality successfully implements its much-anticipated pointsmen project. This comes after council gave its approval for the acting City manager Neli Ngcobo to sign a memorandum of understanding with Traffic FreeFlow to pilot the pointsmen project. The company owns and manages the project which is currently operating in the cities of Johannesburg and Tshwane, where it has 232 pointsmen manning traffic intersections every day. Msunduzi currently has 53 traffic officers. The plan is to have two types of pointsmen; those who would be stationed at specific high traffic intersections and others who could be dispatched on motorcycles to traffic hotspots at a moment’s notice when traffic signals are either faulty or there is a power outage. Ngubeni said the municipality would benefit from having this project because it would free up its law enforcement officers from attending to traffic congestion to focusing on reducing criminal activities. The recruits for the project would have to undergo a screening and interview process. Training would then conducted by a traffic warden and Traffic FreeFlow. “Pointsmen come from previously disadvantaged backgrounds and may not have held a job before. “Traffic FreeFlow looks for a person who is able to cope with stressful situations (standing in traffic can be very stressful) while remaining calm and collected,” said Ngubeni. Ngubeni said challenges faced by pointsmen included being exposed to weather elements, as they worked outdoors, and injuries sustained while on duty. He said they were also subjected to abuse from unruly motorists. With regards to ensuring that the pointsmen reported for duty, Ngubeni said Traffic FreeFlow monitored all its employees through GPS enabled devices and they were also required to be in constant communication with the operations centre. Motorists who recently spoke to The Witness welcomed the news of the project, with some saying it was long overdue. “We’ve always had problems when there are power outages in the CBD but load shedding has just made things worse. “Last week I was stuck on Boshoff Street for more than 20 minutes and I didn’t see a single traffic officer,” said Simangaliso Mtshali. Nompumelelo Mngadi — who previously lived in Gauteng — said the pointsmen project would change the lives of Pietermaritzburg drivers for the better. She said all the major cities should consider having the programme. “Being stuck in traffic in the morning can ruin your entire day because once you are late for one appointment you spend the whole day trying to play catch-up,” Mngadi added. Taxi driver Gcina Nxumalo said he was in support of any programme that would alleviate traffic congestion in the CBD and Edendale. 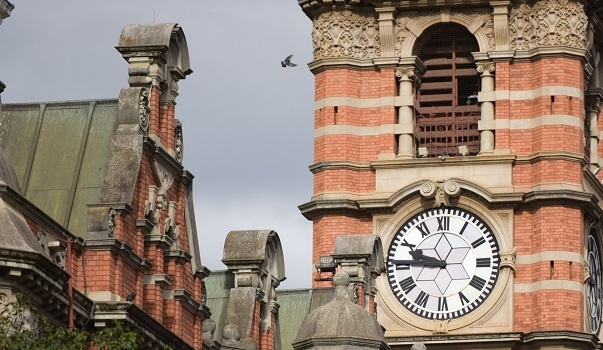 He added that Pietermaritzburg’s main streets, including Church Street, were always congested during peak hours, even when the traffic signals were not faulty. Wayne Watkins joked that the pointsmen would end up in hospital as they were likely to be run over by motorists who could not drive properly. He suggested that they have body cameras attached to their bibs in case there is an accident and the driver runs off. “Having pointsmen will help but it won’t solve the serious problem of incompetent drivers. There are dozens of drivers who don’t know what to do when they approach a four-way intersection if the robot is not working,” Watkins said. • Lack of road infrastructure development and upgrades.